Ahoy matey! Your crew will go overboard for the awesome Adventure Galley inflatable bounce house. This bright, colorful bounce house is designed to resemble a pirate ship with masts, waves, portholes—even a jolly roger skull and crossbones! Ahoy matey! Your crew will go overboard for the awesome Adventure Galley inflatable bounce house. This bright, colorful bounce house is designed to resemble a pirate ship with masts, waves, portholes—even a jolly roger skull and crossbones! 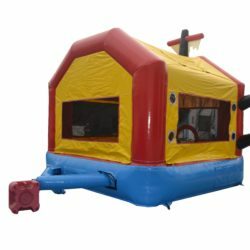 So get all your shipmates on board for a high-seas high-fun adventure with the Adventure Galley inflatable bounce house. In addition to all of these fun features, this bounce house was designed with safety and durability in mind and constructed with only the highest quality 15 oz. “lead free” materials.